The full cast for To Sir With Love, joining the previously announced Olivier Award winning actor Matthew Kelly (Florian), is Mykola Allen (Denham), Harriet Ballard (Monica), Peta Cornish (Gillian), Kerron Darby (Seales), Ansu Kabia (Ricky), Paul Kemp (Weston), Heather Nicol (Pamela) and Nicola Reynolds (Clinty). 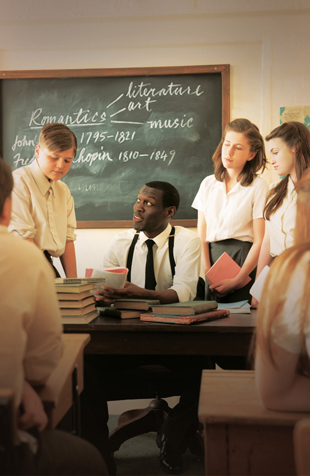 Based on E R Braithwaite's autobiography and adapted by Ayub Khan Din, To Sir With Love is the story of Ricky Braithwaite, an ex-RAF fighter pilot and Cambridge graduate who arrives in London in 1948. Despite his first class degree in electronic engineering, he is turned down for job after job in his chosen profession and discovers the reality of life as a black man in post-war England. Taking the only job he can get, Ricky begins his first teaching post, in a tough but progressive East End school run by the enlightened headmaster 'Florian'. Supported by Florian the determined teacher turns teenage rebelliousness into self respect, contempt into consideration and hate into love, and on the way, Ricky himself learns that he has more in common with his students than he had realised. Made into a major film in 1967 starring Sidney Poitier and featuring the song To Sir With Love, made famous by Lulu, this new stage adaptation is peppered with the songs and dance of the late 40's, a time of austerity like our own, where love, inspiration and hope win through against all the odds. To Sir With Love was E R Braithwaite's first book and was written in 1959. Later publications include Paid Servant, A Kind of Homecoming, Collected Short Stories, Choice of Straws, Reluctant Neighbours, Honourary White and Billinglsy, The Bear with the Crinkled Ear.